Take a hair-raising ride with Stowaway as we rocket around the world. 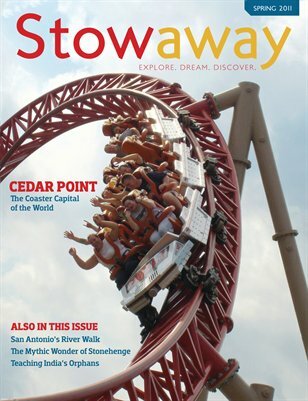 First on route is Cedar Point in Sandusky: America's Roller Coast. After that, you can bike through America on scenic rail trails, then travel south of the border to learn the Brazilian martial art of Capoeira. Or you can go to Paris and indulge your sweet tooth. We live to serve as we teach in India or explore the needs of Haiti. Stay for a while in Ecuador, or a weekend in your own backyard. Wherever you go this Spring, let Stowaway be your travel buddy.